It is not all that uncommon for a homeowner to buy their own fencing and install in on their own. However, this is not the type of DIY landscape project that you want to take lightly. Many homeowners will not realize the scope of such an undertaking until they are in too deep. Instead of falling into this trap, you can look for a dependable fence company in Marysville to get the work done for you in a timely fashion. As you look around for the right fencing company for the job, you will see that there are some steps that you should never miss. For example, you need to take the time to research the top companies in the Marysville area that come with the best customer reviews. A simple search online should bring you a wealth of information on companies that local customers have been happy with. Estimates are another thing that you never want to overlook. While it may be tempting to go with the lowest quoted price, you need to remember that price is not always everything when it comes to such an installation. When we come out to your property, our team at All About Fence will take the time to go over all of the questions that you have. We will take a look at any potential obstructions, go over the types of fencing available to you, and evaluate the access we will have to the job site. It is our goal to make sure that you have the ultimate fence for your home or business. Hiring a fence company in Marysville is something you want to consider carefully. We would love to talk with you about your fencing project, so call us at All About Fence at (425) 268-9779 today! All About Fence can install your cedar wood fence in Bothell. Cedar is a fantastic wood type. Its unique color can be preserved by adding a clear coat finish, or it can be allowed to weather to a soft, natural grey tone. It is naturally resistant to decay, making it the perfect outdoor wooden fencing material. Your cedar fence can be installed at any time of the year, even if it is raining or there is snow on the ground. We are frequently asked if we can install fences in the winter. The answer is that, yes, we can. Oh, we like good weather better. But if your installation date rolls around and nature decides not to cooperate, we can still get the job done. Cedar makes a beautiful fence because it can be used to create a picket fence or it can be used as a privacy fence. It can take a finish, but it can also be rough sawed to good effect. One way to help preserve your cedar fence is to install uprights that have a metal rod in the foot. This rod is then fixed in concrete that slopes away from the wood. This keeps it from touching the earth and allows moisture to drain away from it. 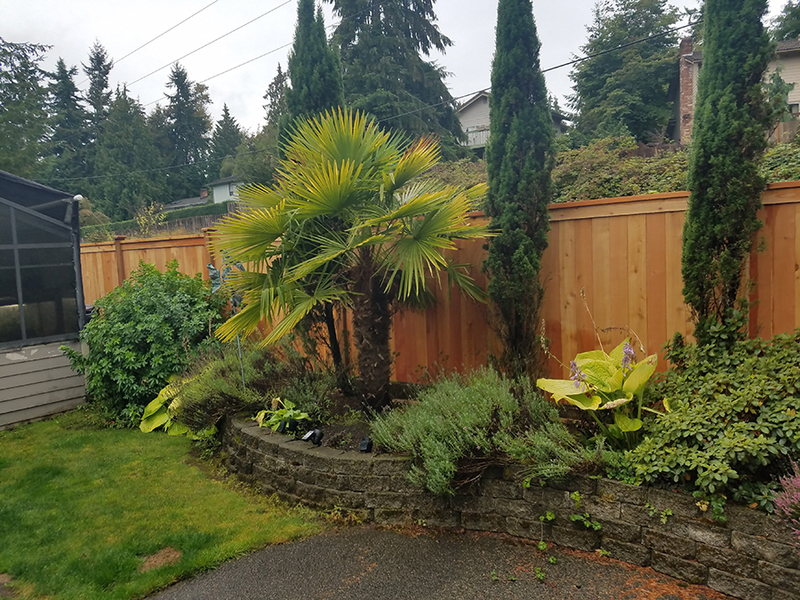 To learn more about how All About Fence can install your cedar wood fence in Bothell, call (425) 268-9779 for a consultation today. We can send someone out to look over your site and make an estimate and set up a time for installation. We have several designs for you to choose from, and we are always glad to install another cedar fence. If you have an existing fence that needs repair, we can help with that, too. 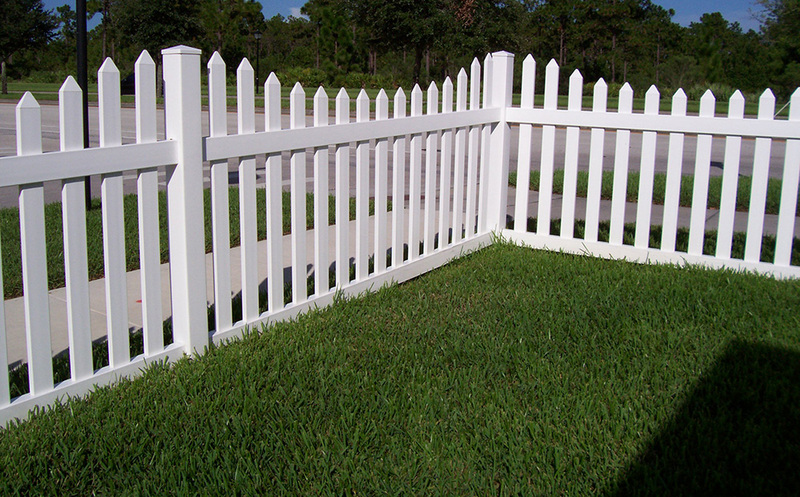 All About Fence can take care of your picket fence installation and repair in Mill Creek. 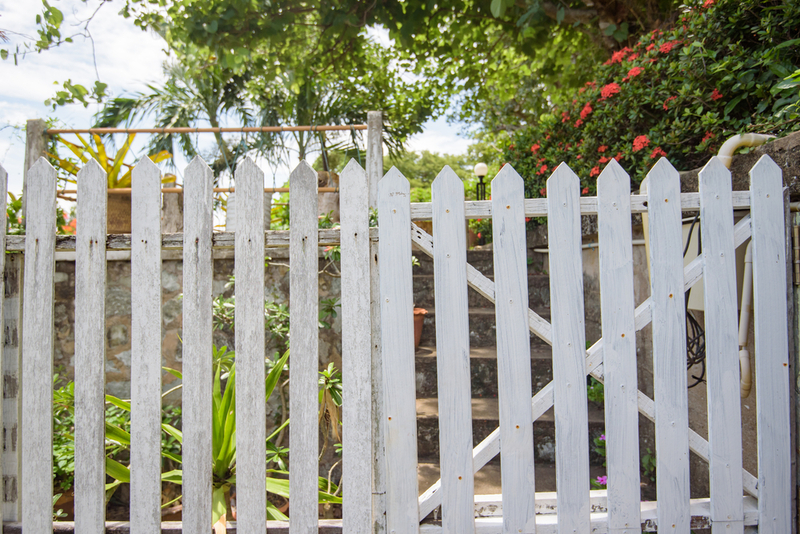 The white picket fence is such a cliché that it is often used as a reference to seeking a quiet life of prosperity. However, the picket fence can be efficient, economical and beautiful – which is why so many homeowners choose this design for their property. It can be used to dress up the edge of a property, restrain pets and small children and even to edge a garden or flower bed. With the right pickets and set-up, it can even be part of your home security. Picket fences are a part of American history. In some cities, they were once required as markers for the edge of properties because they could create a clear demarcation of the boundary, restrain pets and children, and still allow homeowners to display ornamental plantings of decorative trees and flowers. The term “picket” means a sharpened post or pale. 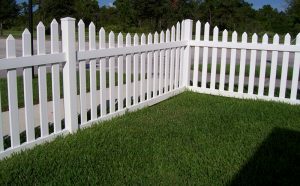 A picket fence is usually made up of flat boards that are tapered to a point or an ornamental design at the top, which is attached at the bottom and top to horizontal rails that are, in turn, attached to vertical posts. Regardless of your picket fence needs, we have the experience and industry knowledge to make sure that the job is done correctly the first time. All About Fence can take care of your picket fence installation and repair in Mill Creek, just give us a call at (425) 268-9779. Our picket fences can be made of vinyl, cedar, cypress, oak or bamboo. The vertical posts can also be seated on a metal base set in concrete to promote longevity. All About Fence has the wrought iron fence installation Service & Repair in Lynnwood that you need. In fact, wrought iron is one of our specialties, although we can install or repair all kinds of fences. Our family-owned business is invested in helping you have a beautiful, functional fence that will go with your landscape. Throughout the changes in the seasons and the holidays upon us, we would like to share a few tips about decorating your fence for the holidays. There is absolutely nothing more beautiful than a well-kempt wrought iron fence decorated with pumpkins, turkeys, swags of greenery, wreaths or colorful lights. Just some small reminders: if you have an automatic gate attached to your fence, keep decorations clear of moving parts. When decorating with lights, use only those that are rated for use outdoors and make sure they are plugged into GFCI outlets. If you don’t have a GFCI outlet, you can purchase an adapter at your local hardware store. Use plastic hangers when attaching electrical lighting to metal fencing, and always check last year’s light string for worn places. If your wrought iron, or any other kind of fence, needs a little fixing up before you decorate, we are ready to help. Get in touch with All About Fence at (425)268-9779 for your wrought iron installation service & repair in Lynnwood. We are always available to help you keep your fence looking its very best, or to install a new fence if that is what you need. We can make gates that will match our fences, although we do not install openers. We are happy to help you get your fence ready for any season, and especially for the holidays. All About Fence is prepared to help with your residential or business chain link fencing installation service & repair near Snohomish. 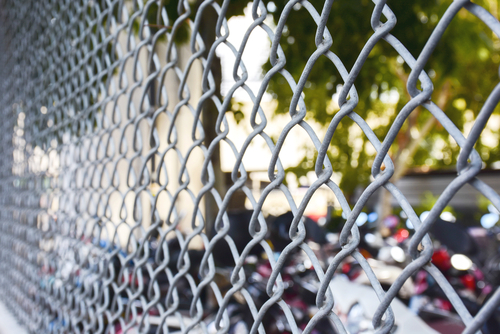 Chain link fencing is sturdy, weather resistant and provides a good barrier for restraining pets or setting a perimeter for children. It is also useful for marking boundaries in commercial settings. Our chain link comes in two colors: galvanized and black. PVC coating is available. The advantage of the coating is that it protects the wire from exposure to weather, helping to prevent corrosion or rusting and therefore prolonging the life of the fence. If you would like to mask an area, such as a trash dumpster, opaque privacy slats can be added to the fence. Chain link fences can be decorative as well as utilitarian. The privacy slats can be organized to spell out a company or family name, or to display a picture or ornamental geometric pattern. They come in eight different colors, giving a good palette for design work. We can also create matching gates, although we do not install automated or electric gates. We can, however, recommend companies that do that sort of work. 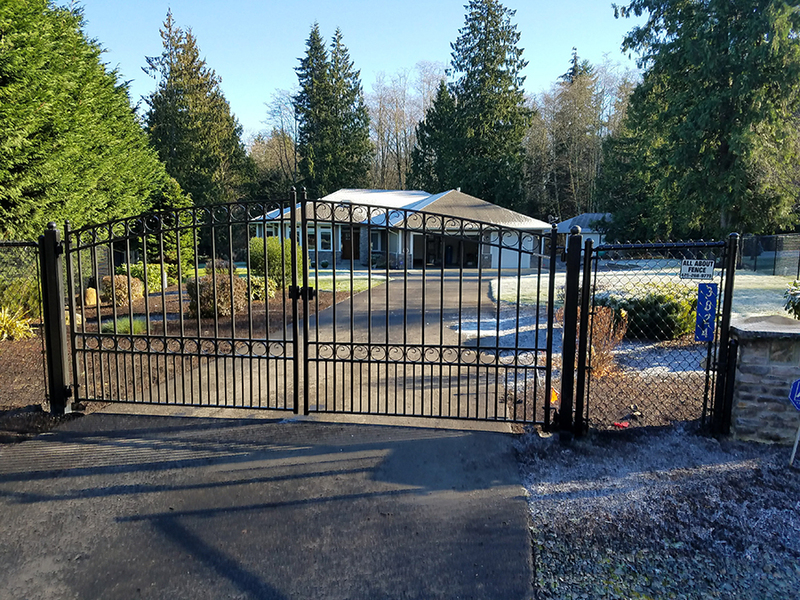 If you are ready for residential or business chain link fencing installation service & repair near Snohomish, call All About Fence at (425)268-9779. We can install fencing at any season. Autumn is a good time to put in a fence or to repair one, making it part of your seasonal cleanup and preparation for winter weather. We will be more than happy to discuss options for a simple chain link or for a design using the privacy slats. Our goal is to make the world a better place, one beautiful fence at a time. Autumn leaves are beginning to drift down onto lawns, school children are making their way to those hallowed halls of learning, and it is time to think about getting your pool ready for winter. All About Fence is ready to help you winterize your pool fence in Marysville. Your pool fence, and many others like it, are a response to a need. 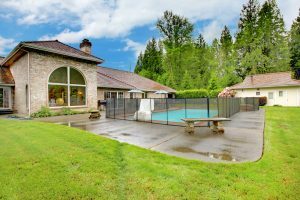 Statistics have indicated that far too many accidental drownings or injuries in a dry pool occur in private, backyard pools. As a result, regulations have been established that include fencing those backyard swimming pools, even the temporary above-ground types. Your pool fence doesn’t have to be a basic, utilitarian piece of equipment. It can be beautiful, and it can add to the general ambiance of your backyard. Whether it is chain link, wrought iron or wood, yearly maintenance will help keep your pool fence looking good. Typical maintenance events might include painting, checking latches and locks, repairing or replacing damaged panels or, if it is a chain link with privacy panels, changing out damaged panels. You could even exchange your colored privacy panels for a completely new set to go with the changing seasons. If you are ready to winterize your pool fence in Marysville, call All About Fence at (425)268-9779. Whether your fence needs general maintenance, repairs or completely replaced, we have the team who can do the job. If it has to do with fencing, we can help you handle it. We even make gates, although we do not install automatic gate operators. Our goal is to help you make your fence efficient, effective and beautiful at all seasons of the year and for every occasion. We firmly believe that utilitarian can be beautiful. Vinyl can mimic almost any kind of wood fence. All About Fence has your durable and attractive vinyl fence installation service & repair in Everett. Vinyl fences have the happy attribute of requiring little maintenance. They do not need to be painted, and they do not rust. They might benefit from power washing now and then. Vinyl fencing can simulate almost any kind of wood fencing, from white picket fencing to privacy fencing. It usually comes in preassembled panels, which makes it easy to install quickly. Some models, however, come in individual boards, not unlike cedar fencing. Vinyl fencing is sometimes made from recyclable materials, but not all of it. When your vinyl fence panels wear out and need to be replaced, the plastic panels can be recycled. So, if you are looking for a renewable fence type, vinyl could very well be a good choice for you. The panels come with breathing spaces to allow wind to pass through, which lets them withstand most ordinary windy weather. There is even a type of heavy-duty vinyl fencing made specifically for horses. It presents a trim appearance around a pasture or corral. Best of all, vinyl fencing is sufficiently sturdy for most purposes, comes in several different colors, and never requires painting. Power wash occasionally to prevent growth of moss or mold and to remove grime. Give All About Fence a call at (425)268-9779 to learn more about our vinyl fence installation service & repair in Everett. Vinyl fences can be a durable, attractive choice for your fencing needs, whether it is to surround your backyard pool, restrain pets or other animals, or to simply make an attractive border around your lawn or yard. A vinyl fence is low maintenance and weather resistant and can give good service for many years.